Three envelopes are sitting by the door for mailing tomorrow — my contract with Broome Community College for the non-credit colored pencil course (page 10 in the catalog) I’m teaching in the spring, my application for exhibiting membership in Cooperative Gallery 213 (hope I haven’t waited too long on that! ), and my application for the Downtown Binghamton July Fest. Looking forward to all of those, as I get more involved in the fine arts community. This year I’ve resolved to have a larger range of ready-to-sell prints of my work at art shows — last year my offerings were too limited, I think, and not as well presented as I would have liked. And this year I’ll show a couple of on-the-spot portraits that are more representative of what I actually do. Wish I had some photos of the ones I did last year — every one I made, I let get away without a picture! I’d especially love to have a photo of both the subject and the portrait of the little boy (10 years old, maybe) who was an aspiring artist, and spent his own birthday money for the portrait. Other resolutions: an improved display set-up for shows (I’ve already made new black fabric panels for my PVC frame – think I’ll either paint the existing frame black, or start all over with a different design) and a jewelry and vintage shop on Etsy, separate from GreenBoat Gallery. Speaking of photos… here’s one from July Fest 2011. You can find more at my Flickr site, in the “Exhibits and Juried Shows” collection. 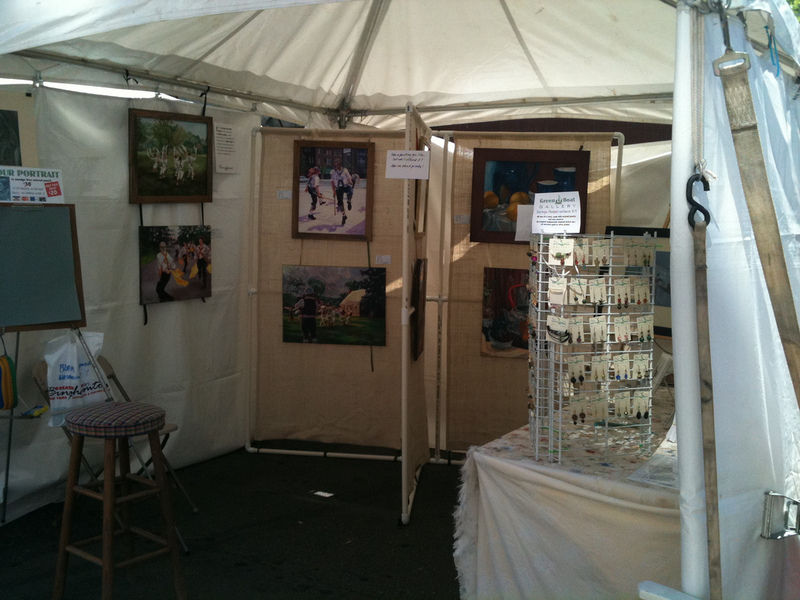 My display at July Fest 2011 - love that they furnish the tents and tables!